The streams, ponds and swamps of Southeast Asia are home to a genus that includes many of our most beautiful and varied rosette plants. This is the genus Cryptocoryne. Crypts, as they are often referred to by hobbyists, range from tiny plants suitable for foreground lawns to large stately plants that can fill in the background of any but the largest tanks. Cryptocoryne spp. have leaves varying in shape from cordate to strap-like. They can be as small as 2 inches or as large as 20 inches or more. They range in color from bright grass green, through forest green, olive, bright pink and mahogany brown. The same plant grown under differing conditions can vary amazingly in appearance. Their flowers, shaped like elongate jack-in-the-pulpits, give them the outdated common name of water cup. In the aquarium, they reproduce either by runner or by offset. In the wild, they use these methods, as well as sexual reproduction. Because they rarely flower underwater, spontaneous sexual reproduction in the aquarium is highly unlikely. Cryptocoryne have been used as aquarium plants for over 60 years. There are photographs of them even in early editions of the book Exotic Aquarium Fishes by William T. Innes. They have a number of characteristics that make them useful as aquarium plants. Besides the amazing variety of sizes, shapes and colors, many are among the most shade tolerant of aquatic plants and, when properly cared for, many species are hardy, productive and long lived in the aquarium. Although Cryptocoryne spp. were well known to serious hobbyists in times past, for a number of years they became very difficult to come by. Things have changed within the last few years, however. Today, it is not uncommon to find very nice examples of some of the hardier, more common species available even at the large chain stores. More unusual species and those that are more delicate are more likely to be found either through mail-order plant distributors or by trading with other hobbyists. 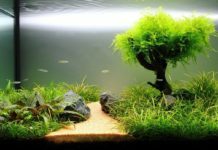 Crypts are more expensive than some other aquarium plants because they are propagated much more slowly. But they are worth the higher price in terms of beauty and usefulness in the aquarium. In the past, Cryptocoryne spp. have acquired the reputation of being difficult to grow plants, suitable only for the experienced hobbyist. This is far from a universal truth, however. While there are some difficult species, there are a number of extremely beautiful ones that are even suitable for a newly set-up novice tank. In nature, Cryptocorynes are found under an amazing variety of conditions — in swift-running streams and quiet backwaters, in full sun and deep shade, in fairly cool water to incredibly warm water, and in water that ranges from soft and acid to slightly brackish. Contrary to popular opinion, there is a number of them that do very well in very hard water as well. Most commercially available crypts are quite adaptable. I have had the same species of Cryptocoryne — actually offsets from the same original plant — living in tanks with very different conditions. I had them in tanks with a pH of 8.2 and others with a pH of 6.6, and I had temperatures varying from 74 to 84 degrees Fahrenheit. Some of these tanks have supplemental CO2, some have had substrate heating, some have very bright light and some are decidedly “low tech.” While growth is faster in some of these tanks than others, and the plants may look different due to cultural variations, the fact remains that they are attractive, healthy and reproducing in all of these tank. There are three areas where Cryptocoryne are not particularly tolerant. Most require a suitably enriched substrate, stable tank conditions and very clean water. 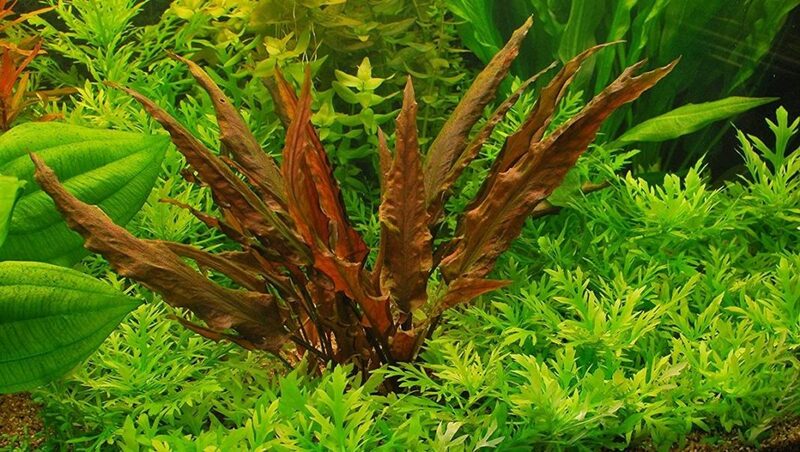 The need for an enriched substrate is one of the reasons some species of Cryptocoryne fail when introduced to a newly set-up tank, particularly one with a plain gravel substrate. In the wild, these are plants that vary from fully submerged to emergent, to periodically submerged. For this reason, they are adapted to extract the nutrition they need directly from the substrate. Planted in sterile aquarium gravel, there is nothing for them to feed on. I have found that crypts do well for me in a fine gravel substrate amended with laterite, sometimes with the occasional use of plant food tablets. 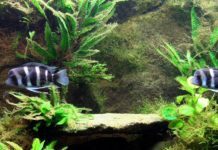 Other people have very good success with their crypts in tanks that have peat or potting soil or even garden soil in the substrate. I suggest that if you want to try one of these latter methods, you contain the peat or potting soil in a flowerpot or other container. If you decide to use a soil substrate, remember that the organic component in these substances can predispose a tank to algae problems. 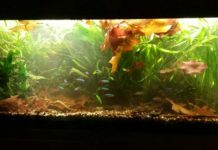 Old-time aquarists found that many species of Cryptocoryne did extremely well in older gravel-bottomed aquariums where fish wastes had been allowed to accumulate for a long period of time. Stable conditions are extremely important for good Cryptocoryne growth. 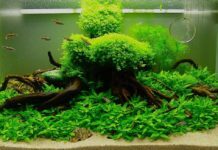 Most tanks go through a period of instability for the first few months and this can be particularly true in a tank set up by a first-timer aquatic gardener. People choose the wrong plants and some die off, loading the water with organics. Algae blooms occur and the impatient hobbyist plays with the lighting or water chemistry to try to alleviate the problems. For that matter, the cycling period itself can be too much for some crypts to handle well. The way a Cryptocoryne reacts to changes in its environment is to ‘melt’. A large stand of plants can look healthy one day and be gone 48 hours later! At that point, a person unfamiliar with crypts will assume the plants have died, and throw out the roots and rotted leaves. This is usually a mistake. While it is certainly a good idea to dispose of the rotted leaves, as long as conditions in the tank can be stabilized, there is a very good chance the plants will grow back from the rootstock if this is left undisturbed. I was recently told of a crypt that had finally recovered two years after its initial collapse! Fortunately, this is rather longer than average. If conditions can be stabilized, it is not unusual for a melted stand of crypts to completely regrow in a period of a few months. The exact mechanism involved with Cryptocoryne “meltdowns” is not fully understood and specific causes cannot always be determined. It is clear that a heavy load of dissolved organics can be a factor. It is likely that poor conditions, including heavily polluted water, allow bacteria to attack the plant leaves precipitating the decay of an entire stand. With good water quality, the plants may weather a sudden change in lighting with only a few lost leaves. The same plants in a poorly maintained, overstocked tank might melt entirely. This is one more good reason to maintain a regular schedule of frequent partial water changes. 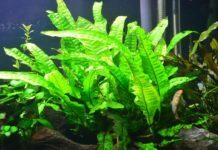 As supplemental CO2 has become more popular, a number of people have added CO2 systems to their tanks, only to see established stands of Cryptocoryne melt away before their eyes. This has led to the assumption that the supplemental CO2 was in some way harmful to the crypts. This is not the case. Most people add lighting at the same time they add CO2, and the CO2 certainly drops the pH in the tank. 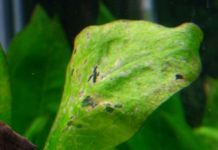 Because we have already discussed the need for stability in a Cryptocoryne tank, one can easily see that these changes in themselves are enough to cause problems. In my experience, most commercially available Cryptocoryne species do extremely well in “high tech” tanks once they are adjusted to their new surroundings. On the other hand, as comparatively slow-growing, root-feeding plants, crypts are capable of making do with very low levels of dissolved CO2, particularly in low light situations. 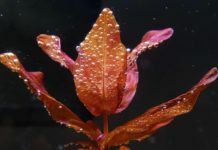 This makes them extremely useful plants for the low-tech tank as well, often providing the only splashes of red foliage that prosper under low light. Once you have become adept at keeping Cryptocoryne, you will probably find that your crypts are beginning to reproduce vegetatively. Some species will produce very dense stands with offsets right at the base of the parent plant. Others, given space, will send runners far and wide in the tank. Cryptocoryne blassii and Cryptocoryne pontederifolia do this frequently. Cryptocoryne seem to need to reach a ‘critical mass’ before they start to do really well. A single plant or even two or three will often limp along for a prolonged period without increasing much. Then when it finally reaches a respectable size, the stand will take off and start producing offsets at an amazing rate. Young plants that arise from long runners and are well separated from the parent plant are easy to remove for use elsewhere. Simply dig up the young plant and cut the long runner back to the parent. Those that grow in dense groups are a little more problematic. Particularly in the confines of the aquarium, the roots are often tightly intertwined with those of other plants. Sometimes it is possible to remove smaller plants from the edges of the stand. Other times, the entire stand must be lifted and sections gently pulled apart if at all possible. If the plants are hopelessly matted together, a sharp knife can be used to divide the root mass into sections for replanting. A very interesting project is to see if you can get your Cryptocoryne to flower. Only a very few species will flower underwater, so you need to set up a tank where they can get their heads above water. At the same time, they need very high humidity, so the tank should be kept tightly covered and the airspace warm. 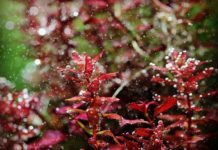 Make sure your plants have a nutrient-rich substrate and clean water, then sit back and wait. If you are patient and lucky, you might have the pleasure of seeing water cups flowering right in your own home. Even for experts, Cryptocoryne spp. are very difficult and in some cases impossible to positively identify unless the plant is in flower. There are many very variable forms of some species, and more being discovered each year. Even among cloned plants, the foliage is just too variable based on the conditions in which the plant is grown. Another problem with crypt identification is that many books have incorrectly identified photos. In most cases, the species names assigned to plants commercially should be regarded as “probable” identifications too. The fact that you don’t have a sure identification on a plant doesn’t make it any less desirable in terms of an aquarium specimen. In fact, as with many domestically bred fish, the commercially propagated crypts are often much hardier than those collected in the wild. What follows is a listing of some of the easier, commercially available species to keep an eye out for. This lovely species varies in height from 4 to 12 inches, depending on conditions in the tank. The top side of the lanceolate leaves is bright green with lighter vein patterns, and the underside is often a pretty rosy color. Cryptocoryne affinis seems to prefer softer more acid water, but is a fast grower under conditions to its liking. The downside of this species is that it is particularly prone to meltdowns and needs very stable conditions. C. affinis is the plant Cryptocoryne growers love to hate. In conditions that are to its liking, it can produce huge dense mats of plants, and seem almost invasive. In other cases, people who know a lot about plants and do very well with many species find it nearly impossible to keep this species going. If you have the opportunity to work with this plant, give it a try. But don’t give up on Cryptocoryne in general if you don’t succeed with this one! While this plant is actually a race of C. cordata, the commercial suppliers seem to be consistent about calling it C. blassii. Whatever you call it, it’s a very nice plant with large round leaves, olive green on the top and deep maroon beneath. It can take some time to get established, but then spreads vigorously via runner. Usually sold as “C. balansae,” this plant is believed by Jacobsen to be a variant of C. crispatula. This plant can definitely take its time when it comes to getting established, but is well worth the wait. Its long strap-like deep green leaves can grow up to 16 inches and can have a wonderful dimpled surface or be smooth and shiny. This is a crypt that does better with at least moderately hard water and brighter light than many. 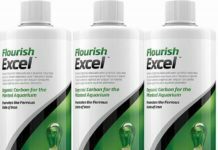 I have found that in my tanks it does best in areas with a very strong water flow, which makes sense as it is found in the wild in fast-flowing streams. Cryptocoryne pontederifolia is a striking light-green plant with good-size ovate leaves that are broader at the base and come to a sharp, elongate point. Under bright lighting, this plant is compact and smaller, while under moderate lighting it grows large enough to be considered for mid-ground planting. One thing I particularly like about this species is the peculiar shine of the leaves. They reflect light in a way reminiscent of watered silk. This plant has been collected in the tidal zone, making it a good candidate for a brackish tank. I have found this to be a very hardy species, although some sources caution that the plant does not easily tolerate repeated transplant. Probably the most commonly available Cryptocoryne, this species comes in a wide range of colors and sizes. One of the most striking, and my personal favorite, is a tall red variety called ’Mioya.’ There are also green, bronze and smaller red varieties. Cryptocoryne wendtii accounts for many, if not most, of the “generic Cryptocoryne” that show up in pet stores. It is arguably the easiest crypt to keep, and is undemanding in terms of water conditions. This sterile hybrid is a cross between C. parva and either C. walkeri or C. beckettii. 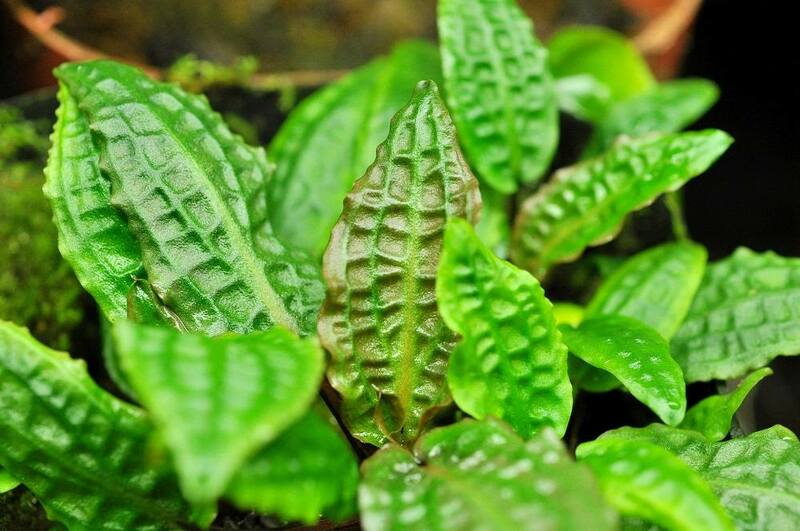 These plants are some of the midgets of the genus, with light, bright-green lanceolate leaves only about 2 inches long. They make lovely foreground plants if used in large numbers, and they spread readily if left undisturbed. Why are My Aquarium Plants Dying?